Many of us can agree that we spend more time than we’d like sitting between four walls. 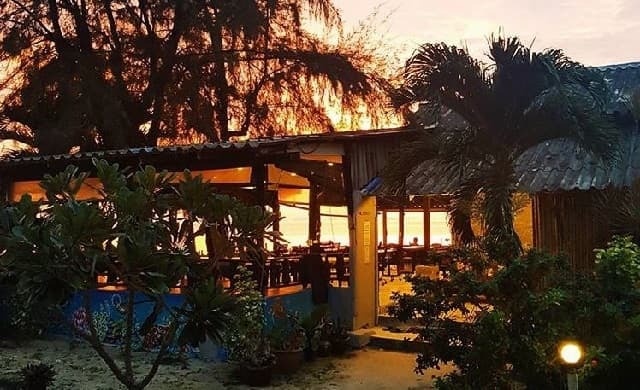 But, situated on an idyllic beach on the island of Koh Phangan in Southeast Thailand, a coworking space named BeacHub has taken a stand against the fast-paced, boxed-in lifestyle of many a city-dwelling worker. Calling itself “the world’s first beachfront coworking space”, BeacHub’s workspace and lounge is essentially a large porch, laid with desks, private seats, meeting tables and hammocks, that opens out to sand and sea in what BeacHub calls “wall free space”. The decor here furthers the essence of island living, with rustic-style wooden furniture and a palm roof. Alongside this enviable set up, BeacHub also boasts a private room in which teams can work together, a quiet room, a private meeting room and a “cold room” – presumably a necessity for many in the Thai sunshine. You can also find talks and masterclass events held here. So BeacHub has all of the coworking essentials – but it also offers coliving. Yes, on BeacHub’s 120-metre stretch of private beach you can rent your own bungalow in which to live; complete with a bed, a hot shower, wifi and air conditioning. As such, BeacHub’s main building is also home to a range of amenities like showers, a cafe, a shop, and a sunrise and sunset lounge where workers can relax and socialise. There’s even an outdoor cinema. While this may sound like a holiday, BeacHub argues that its no-walls, working-amidst-nature approach encourages productivity and collaboration. It’s a sentiment that’s backed up by plenty of research. In a 2012 study, for example, cognitive neuroscientist David Strayer found that backpackers performed 47% better on a creative thinking and problem solving test after returning from a trip into nature, compared to how they’d performed before the trip. However, your employees don’t have to go on a trek into the wilderness to enjoy the energising effects of nature. For instance, Business Insider has reported that, in an analysis of a university building in Oregon, US, people who could see greenery from their offices were found to take 19% fewer sick days than those who couldn’t. Similarly, a report from California Energy Commission found that students who took tests near windows performed better than those who worked in windowless classrooms. So, contact with nature can boost productivity and vitality – but how can you harness this in your office design? You don’t have to relocate to the seaside to adopt the BeacHub philosophy and enjoy the benefits of nature (something tells us the British weather would have something to say about that anyway). Set up portable outdoor heaters and a shelter – such as a gazebo – for when the weather isn’t cooperating. If you wanted to take this a step further, you could look into building a heated shed-like structure, giving staff a sheltered place to congregate while still feeling as though they’re out in the fresh air. Of course, not every office will have its own outdoor space. If you don’t (or if you do, but would also like a contingency space for the wintry months), try designating one of your indoor rooms as a ‘chill zone’ or ‘quiet area’. You could decorate this space with plenty of potted greenery and nature-inspired artwork, as well as comfortable seating. You could even quietly pipe in sounds from nature – such as birdsong or crashing waves – but be sure to ask staff whether this is a joy or a distraction.